Replacing a flute's headjoint is like giving it a new personality. For example, putting a gold headjoint on a silver flute makes it play similarly to an all gold instrument. It is generally acknowledged that many expensive flutes have headjoints that do not allow them to be played at their best. Indeed, by replacing the poor headjoint of an otherwise first-rate instrument, the player can realize its full potential. Another important need for a new headjoint is for the player who owns a moderately priced, mass-produced flute in good mechanical condition. The greatest improvement in its quality, with minimal investment can be the replacement of the headjoint. It is often far less expensive and more desirable to replace the headjoint of this class of instrument than to replace the entire flute with a costlier one. It is important to know that headjoint making is a special expertise apart from other areas of flute making. Unlike traditional makers whose expertise is divided among the many aspects of flute making, my company is exclusively devoted to the art and science of headjoint making. I spend a great deal of time developing improved designs, as is evidenced by the issuance of the Drelinger Optikut® headjoint patents. This specialization is analogous to reed or mouthpiece making as an area of expertise, distinctly different from basic wind instrument making. More and more, flutists are recognizing this distinction and are buying the flute body from one maker and the headjoint from another. At first glance, the headjoint looks like the simplest part of the flute. In reality, it is acoustically the most complex. The headjoint incorporates a universe of details that demand great sensitivity on the part of the maker in order to match it with each individual player and flute body. I believe that the best results can be achieved by working personally with each flutist. My method of working is analogous to fitting eye glasses: you need a variety of lenses to find the combination that works best. When I have done my job, the headjoint responds like a musical lens, helping the flutist to clearly and easily express every nuance. Remember, even those who are satisfied with their present flute should simply try a different headjoint. It may very well give the best results ever. Every flutist is unique. Each of us has a one-of-a-kind embouchure. To illustrate this point here are some photographs from Roger S. Stevens' book Artistic Flute (Highland/Etling Publishing Co., CA). Not seen is the inside of the mouth where differences also demonstrate individuality. Based on the fact that everyone plays differently, it stands to reason that a headjoint is a very personal choice. Finding the right headjoint can be very time consuming, but absolutely necessary, if you are to play at your best. In order to understand what is needed, I work with each person on an individual basis, pointing out both the strengths and weaknesses of their original headjoint. Next, I make every effort to provide a new headjoint which corrects these weaknesses while maintaining the original's desirable characteristics. My work involves hearing through my customers' ears and sensitizing myself to what they perceive. When they try headjoints, I watch, as well as listen, to see if there is muscle tension around the area of the embouchure. When a headjoint is properly matched to the player, it seems to meld perfectly with the chin and lips, creating an almost relaxed appearance of the surrounding muscles. Remember, in order to play musically, a headjoint must feel good as well as be capable of producing beautiful sound. Make a wish list of all the qualities you would like to have in a new, improved headjoint. Also include the qualities you most like about your present headjoint. Don't practice on your old headjoint for any length of time before starting out to try new headjoints. Bring along your old headjoint as a reference for comparison. Always play the headjoints being evaluated on your own flute body. Bring along another pair of ears, preferably a person whose musical judgement you respect. Have this person listen up close and at a distance when comparing headjoints. If the headjoint is correctly made and matched to the player, it will more than likely sound as good from far away as it does close. To make your comparison, choose a short musical selection that comprises all of the elements that put a headjoint to the test. Play this selection on your headjoint first, then try it on each headjoint to be compared. It is interesting to note that often there is a greater perceived difference between headjoints to the player than to the listener. This is especially true of silver compared to gold headjoints. Please note that each headjoint to be tried should have its lip plate cleaned with alcohol. It is important that a new headjoint produces all registers evenly and easily, especially in the low register. If, after a few minutes of trying, you still have trouble focusing the tone, that headjoint is probably not for you. It is similar to buying a new pair of shoes: if they do not feel good in a few minutes, they will, more than likely, not "wear-in." Ask yourself how comfortable the headjoint feels against your chin, lips, and facial muscles. A well matched headjoint should meld with you without introducing any stress. Test how rapidly and clearly you can articulate, especially in the low register. Test to see how loudly you can play in the low register and how softly you can play in the third octave. Then, try the reverse. Test for middle register break-up. Play as loudly and cleanly as you can to hear at what level of intensity the sound cracks. Listen also for stuffiness on certain notes in this same register. Test note to note and octave to octave for tuning and timbre consistency. A suitable headjoint can make it easier to lip up or down for pitch regulation. Additionally, a properly made headjoint can help a flute play more in tune with itself and other instruments. Listen for embouchure hiss and compare how this extraneous sound varies from headjoint to headjoint. All headjoints to some extent have this noise; however, some project it less than others. Try the headjoint in a dead to neutral acoustical environment. Remember, recital halls, when filled with listeners, lose much of their live reverberant quality. All headjoints, to some extent, are one of a kind. When you have found the headjoint you want, that should be the one that you take. If it's only a sample or is already sold, you should try the substitute all over again before paying for it. It may very well be what you want, yet because it's an entirely new entity, it requires careful re-evaluation. Remember, a maker's quality is only as good as the particular headjoint delivered to you. To assure the unique individuality of every Drelinger headjoint, each is engraved with own individual serial number to confirm its identity. 1. - What help can you offer someone like me who does not have any idea what l am looking for in a headjoint? The art and science of headjoint making includes making sure that each flutist gets the best headjoint for his or her requirements. One of the most important services I perform is when I am presented with a flute player who has no specific demands at all. When this occurs, I simply encourage the person to develop a point of view. It is as if am attempting to get them to cultivate a gourmet taste for headjoints. And there is no fee or obligation for working with me in a private tryout session. 2. - I am a flutist who is still evolving my skills. If I purchase a headjoint now, will it still serve me well later on? With one possible exception, there really isn't a class of headjoint voicings for beginning students. It is therefore almost a practical necessity to find the best headjoint as early as possible. Here are some reasons to justify such a purchase. Except for the very young, the fundamental physiological make up of the embouchure's total structure is, in many cases, unchanged from relatively early development. While you may evolve significant developmental changes, you still have the same unique physical makeup as before. Very simply stated, one develops and grows with the right headjoint. With the wrong headjoint the opposite is true. In my long-term experience, when the right headjoint is chosen, it provides a clear path for achieving any level of accomplishment. 3. - At what point in my child's development as a flutist should I consider purchasing a custom headjoint? If your child has more than a passing interest in the flute, the optimum headjoint can be of tremendous benefit in both reducing many of the frustrations of learning and in helping to produce a better quality of playing early in the learning process. It is very important that the formation of bad habits, especially in embouchure development, be avoided through the use of the best possible headjoint, along with high quality flute instruction. Also important is a flute body with a good scale that covers with minimal effort. Many of the professional players for whom I have made headjoints tell me that if they had had a quality headjoint and flute body as students, their development probably would have been accelerated. 4. - I have an inexpensive, plated flute, in good mechanical condition. Does it make sense to replace the headjoint? Yes. If you properly select the best headjoint available, it is more than likely it will improve your flute (and playing) in a number of essential areas. A headjoint like this can cost more than the entire flute. However, it is well worth it. Here are some of the reasons: a) By choosing the option of a new headjoint, you are maximizing the potential of your present flute at considerably less expense than it would take to get an entire instrument of similar quality. b) At a later date, you can upgrade by choosing a new flute body, without the headjoint, from one of several top-quality flute makers. By doing this, you will possess a first-rate instrument, matched with your own favorite headjoint. 5. - What should you know if you have a headjoint you like, but want to upgrade by replacing the flute body? When a headjoint is chosen, the choice is based primarily on how well the headjoint fits your embouchure, as well as agreeing with other aspects of your unique physical shape. The flute body also influences the selection of a headjoint, but its role is secondary to the way it matches you physically. Inversely, once you find a headjoint that suits you, that headjoint should be the one you use to select a new flute body. Owning a headjoint you like and are totally familiar with is the key to appreciating the subjective differences between the many excellent flute bodies available today. Knowing this, you can see why it's extremely difficult to make a headjoint and flute body selection simultaneously. Based partly on business considerations, some flute makers l know want you to use their headjoints with their flute bodies. If you insist on purchasing the flute body alone, some manufacturers will gladly sell them without headjoints, while others are a bit more resistant. The amount of high quality flutes available is constantly growing. In a sense, it's a buyer's market. Even so, you must do a good deal of trying to find exactly what you want. There are available many new high quality domestic and imported flutes, as well as a wealth of used flutes offering extraordinary value. Aside from the many categories of top-quality flutes that are instantly available, there is a small group that varies in the fact that they are built to order and are paid for in advance of delivery. While these quality makers provide samples of their work for you to try prior to ordering, there is no reason to assume that the flute delivered will play exactly the same as the sample you tried. If you are not willing to accept these variations, it's probably better to purchase a flute that is available for immediate delivery. 6. - What makes of flute bodies are Drelinger headjoints used with? Here are just a few of the names of flute bodies on which our customers use Drelinger headjoints: Almeida, Arista, Brannen, Albert Cooper, Haynes, Louis Lot, Jack Moore, Muramatsu, Powell, Sankyo, and virtually all major Japanese and Elkhart makes. 7. - I have a headjoint that I like very much and want to purchase a new flute body to match it. Are flute bodies as subject to personal taste as headjoints? Yes. When selecting a new flute body with your own headjoint, you will probably notice that even the same model bodies from the same manufacturer vary. 8. - What are the most common precious metals of which quality headjoints are made? How do they vary in sound? In my workshop, the most popular precious metal tube headjoints produced are sterling silver, 9 karat rose gold and Karritium®. All of these precious metals are alloys, which means that they are combined with other metals to make them structurally and acoustically suitable for their intended use. It is important to understand that gold is denser than silver, which is probably the most significant factor in determining the nature of its sound. The hardness of the headjoint tube contributes somewhat to its tonal quality. However, its role is secondary compared to that of density. The type of metal the head-joint tube is made of determines its timbre. With the exception of our patented Platinum-Air-Reed® and Gold-Air-Reed® features, the metal of which the crown and lip plate are made is an option of personal taste, rather than acoustical consideration. With most makers, the wall thicknesses of their gold tube headjoints range from .002 to .004 thinner than the wall thicknesses of their silver headjoints. Perhaps this is done for reasons of economy. The rationale usually given for this dimensional difference is that the gold wall is made thinner to offset its higher density. In effect, the use of thin-wall tubes weights the timbre of these gold headjoints in the direction of silver. In contrast to this approach, Drelinger has been able to achieve the optimum gold experience by offering the same wall thickness in gold as we make available in sterling silver and Karritium® . It costs a little more, but the results are worth it. l wish there was an objective flute language with a universal meaning so that I could communicate the distinguishing characteristics of each of the metals described here. To my knowledge, no such language exists. In the world of headjoints, the same words often mean different things to different people. The word 'bright' to one flutist means the projection of a beautiful radiance, while to another flutist the same word means strident and steely. Despite this dilemma, I endeavor to give as general a view as possible so that you, the reader, are motivated enough to try these comparisons for yourself. Comparing the sound quality of sterling silver and coin silver headjoints is like comparing identical twins. For the most part, they are alike, differing only in very subtle ways. Silver, whether sterling or coin, has a very musically malleable quality, following sensitively, with minimal resistance, the contrasts produced by the player. I make all of my silver headjoints out of sterling silver because, to my taste, I believe it has just a bit more variety of colors than coin silver. 9 karat gold headjoints typically have a solid tonal center and possess an enormous potential for both warmth and projection. In the hands of some players, the variety of tone colors that can be produced with this metal is without equal. 14 karat has a darker tone than 9 karat but it is also slightly more resistant. Drelinger's Karritium® was developed specifically to combine the acoustical qualities of gold and silver in one metal. Karritium® by its nature, gives you the expanded possibilities of projecting the spectrum of timbre from the light, supple sounds of silver through the tone color associated with gold. 9. - Is there a substantive difference between gold and silver headjoints?Yes. However, this difference is much more apparent to the player than to the listener. Many flutists prefer one over the other, while a far greater number have not experimented sufficiently to have an opinion. 10. - What part of the headjoint gives it its characteristic timbre? I have found that the acoustic source of the characteristic timbre of a silver, gold, or Karritium® headjoint is the headjoint tube. While some claim that a gold lip plate and/or riser (chimney) imparts certain discernible characteristics to the sound of a silver tube headjoint, l have never heard it said that their presence gives the sound of a gold headjoint. For those who want features such as these, we produce the widest variety of gold lip plates and/or risers in any karat, color, or combination. In addition, we offer standard features, customization, and technical services that are not available elsewhere. 11. - Can a new headjoint overcome some of the problems to which the modern scale flutes address themselves? Depending on your specific requirements, sometimes yes and sometimes no. The phrase we often hear to convey the latest and greatest is "state of the art." State of the art was once defined as a point in time between two obsolescences. More than a decade ago, the flute world began hearing much about "modern or new" scale flutes. For some, modern or new, by inference, connotes the improving of that which came before. In some respects, this is true, but not without potential compromise. Generally speaking, with several versions of modern scales, the low register has been pulled up and, usually, the middle register is more in tune with the octave below. That is all for the good, but what else has changed? Some players report that while modern scales have advantages, they can't get used to the accompanying thinning of the tone of the third octave combined with some high note pitch inconsistencies*. It's well documented that if you move the tone holes, the pitch changes, but as a subtle consequence so does the timbre. You can understand why tuning cannot be realistically evaluated without also considering the simultaneous changes in the tone quality. Hence, there is no black and white in defining the newer scales and what came before. The choice of a flute body's tuning is not an athletic event with winners and losers, but rather a very personal choice, based on what compromises you are willing to live with. The headjoint also has a critical role in the production of pitch and timbre. My experience has shown that both traditional and modern scale flutes can be optimized with the right choice of headjoint. In my opinion, the right headjoint is, in part, one that allows the flute to be played both more in tune with itself and other instruments in a natural and unstrained manner. When l have done my job, all octaves have a certain seamless continuity that is easily perceived by player and listeners alike. I often advise people with high quality, traditional scale, standard pitch flutes not to change to another scale without first trying a wide variety of headjoints with their present instrument. More often than not, the selection of a new headjoint eliminates the desire to seek an entirely new instrument. *See section on T.O.O.T.S. 12. - What is the primary advantage of "modern" headjoints? When properly voiced and matched, this style's major virtue is that it can play Louder and more efficiently than traditional types. It seems to require less air and muscle tension to produce a wide variety of colors and rapid articulation. One owner of a Drelinger Headjoint said that when she switched to it, she found that she could do everything she could on her old headjoint, except that now it was easier. 14.- Can a headjoint that plays well in either the low or high register play as well in all registers? Yes. A correctly made and matched headjoint should play equally well throughout all the octaves. If someone suggests that you settle for less, he or she probably is not acquainted with Drelinger headjoints. 15.- What is usually done to a headjoint when the entire flute is overhauled? Overhauling a headjoint usually involves some necessary procedures combined with discretionary ones. The head-cork should be replaced after two to five years of use because these corks deteriorate with use and time. To replace the head-cork correctly, requires a special skill considerably more painstaking than replacing a pad. Tarnish and dirt build-up on both the inside and outside surfaces of the headjoint should be cleaned manually using special non-abrasive metal cleaners and soft cloths. Under no circumstances should machine buffing be used on the embouchure plate, especially around the blow hole. Such machine polishing alters, to some degree, the critical areas so vital to the production of sound. Headjoint dents should only be removed at our factory, using the forming arbor on which your headjoint was originally produced. One of the most common automatic adjustments made during an overhaul is to tighten the headjoint's fit. If you are satisfied with this fit prior to the overhaul, let the repair person know in advance. Drelinger Headjoint Company offers a special overhaul service for our customers. For a fee, we will meticulously perform these specialized procedures on headjoints we produced. Note: If you have any doubt whatsoever about your repairman's understanding of the care of your Drelinger headjoint, do not leave it with your flute when it is given for repair or overhaul. 16.- I have a rose gold lip plate on my headjoint, and it sometimes leaves a slight stain on the area where it contacts my chin. The rose (pink) golds are rich in copper which is responsible for its color. Infrequently, it is reported they leave a discoloration or even exude a faint copper-like taste or smell. To avoid this potential problem, I prefer to use yellow gold for my lip plates which appears to be free of these reported reactions. I also offer Gold-Lip® which is pure gold, topically applied to silver and pink gold lip plates. 17.- How long does it take to hand-make a headjoint? I do not know how long it takes other makers to create their headjoints, but for us it takes 4 to 5 working days of skilled labor from the beginning to delivery to hand-make one silver headjoint. The very large selection we have on hand has been built Up over several years. When a headjoint is sold, its type is made again for inventory. 18.- Is a separate carrying case necessary for a headjoint? Yes, so you can store your original headjoint or simply carry an extra headjoint, in addition to the one in your flute case. 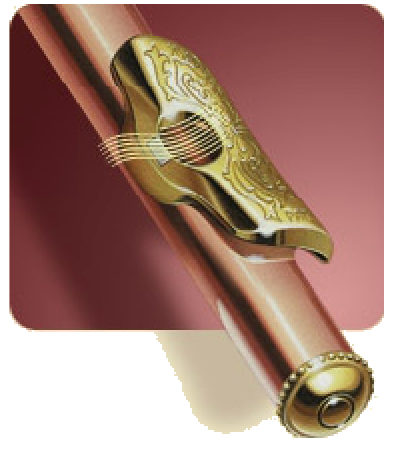 At no extra charge Drelinger Headjoint Company includes a velvet lined carrying case with every flute headjoint sold. 19.- It seems that each manufacturer has its own unique way of describing its headjoint models. Can l really get an idea of a headjoint's suitability from these various descriptions? No detail by itself can give much information unless you understand the interaction between all the vital features. When understood in relation to each other, wall height, blowhole shape and size, and under and over cutting, as well as a myriad of other equally important dimensions help explain the acoustical, ergonomic, and musical make-up of a headjoint. I prefer to describe the complete make-up of a headjoint's critical features in terms of the words, "voicing structure". 20.- Many flute companies offer a choice of headjoints with their flutes. Is this basically the same as what Drelinger offers? No. For example, let's say you need a pair of eye glasses. You have two alternatives to pursue in order to see properly. The first is to try an over-the-counter pair at a drug store and hope it offers some improvement. The second and most effective alternative is to be examined by an ophthalmologist and have the exact glasses prescribed so you can see optimally. I am like the ophthalmologist in that I offer a personalized service and a custom product. 21. - In answer to my wish list for the ideal headjoint, my local music dealer said, "If you want to play softly in the third octave, have maximum projection, and a quick, dark sound, you must purchase at least three different models of headjoints," Do you agree? No. One Drelinger model can satisfy all your requirements and give a multitude of other benefits you can not get with an over-the counter headjoint. 22.- Is purchasing a mail order headjoint by telephone a good way to buy? No. There is no substitute for working with me in person and choosing from the largest selection available anywhere. 23.- Does Drelinger Headjoint Company offer exchanges? Yes. For some time now, we have offered our customers the most flexible and liberal flute headjoint exchanges of any l know of. While the option of an exchange is a worthwhile back up, it's much more important to obtain the right headjoint the first time around. In this regard, it's well worth noting that during the past ten years, Drelinger Headjoint Company exchanged about one percent (1%) of all the headjoints we sold. 24.- Do you offer a credit purchase plan if I select a headjoint, but cannot afford to pay for it totally right now? Yes. Drelinger Headjoint Company will arrange interest free time payments for those who can only afford a down payment on the headjoint of their choice. When you are in New York City, please visit my workshop. Please phone in advance to set up an appointment. The Largest Headjoint Selection Anywhere!